The evening was hectic, and I almost forgot. I had literally just put my son to bed when I remembered, “The eclipse!” We went out to see if the sky was clear. 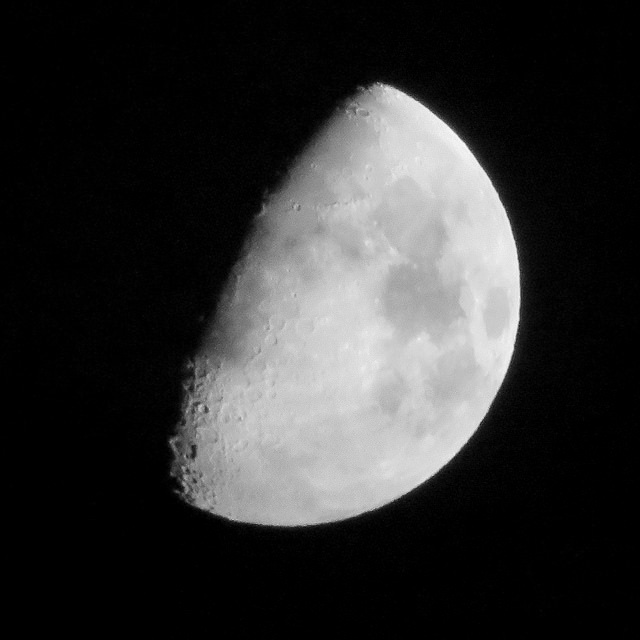 Clouds were rushing across the sky, but for the most part, it was clear, and we had a perfect view of the moon looking like a dark brown chunk of rock in the sky. Update: I went back out about an hour later to check out the view as the moon left the earth’s shadow, and caught these two photos, taken about the same time with different exposures so that you can see either the lit portion of the moon, or the part that’s still in the earth’s shadow. 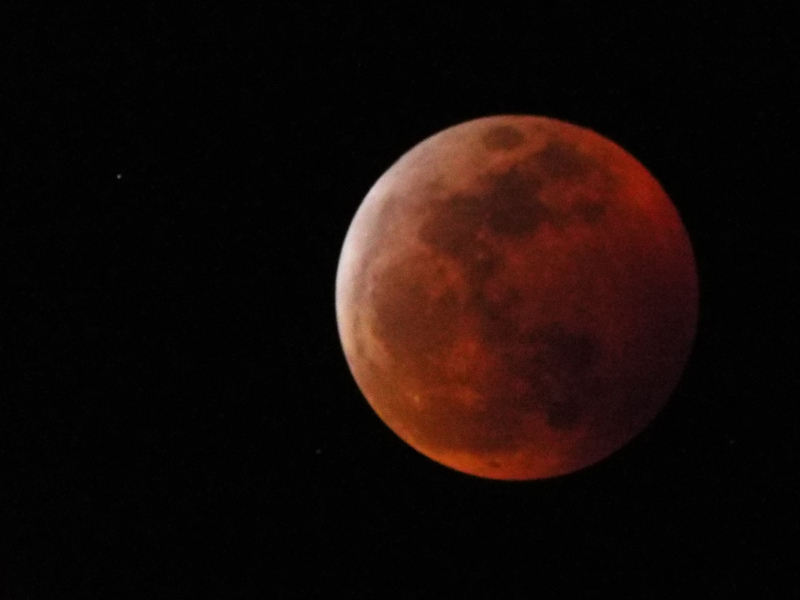 This entry was posted in Photos, Space and tagged eclipse, lunar eclipse, moon on January 20, 2019 by Kelson. I suggest that a deep orange moon right before Christmas be called a Pumpkin Pie Moon. 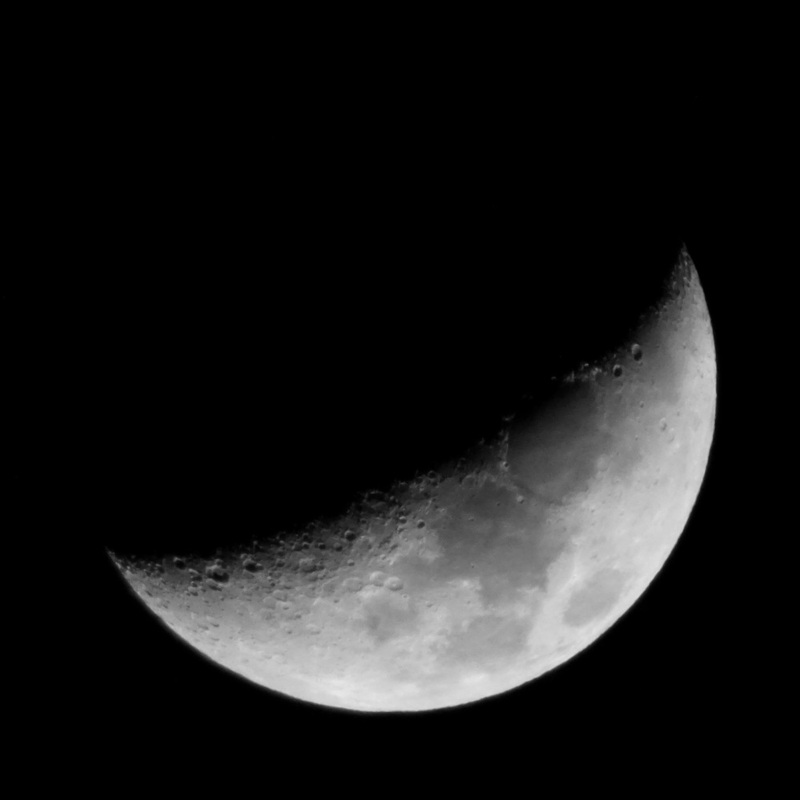 Composite of a background shot (the moon was waay too bright!) 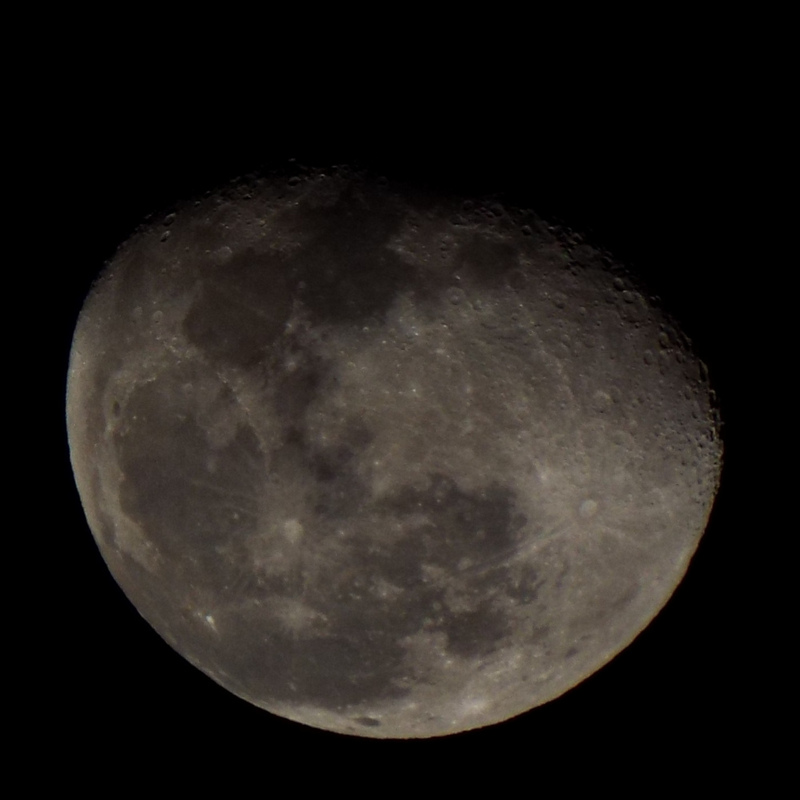 and a zoom photo of the moon. I apparently moved a little bit, so the wire passing in front of it doesn’t line up exactly. 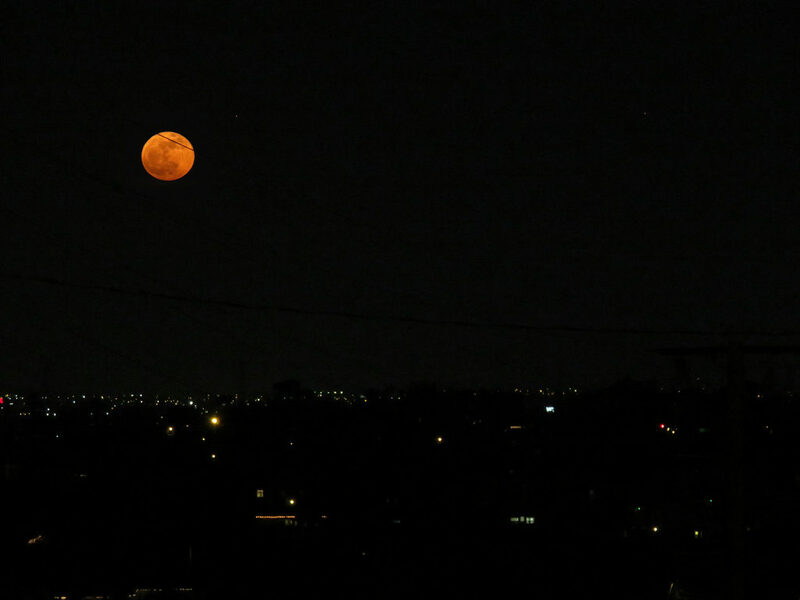 This entry was posted in Photos and tagged moon, Orange on December 24, 2018 by Kelson. 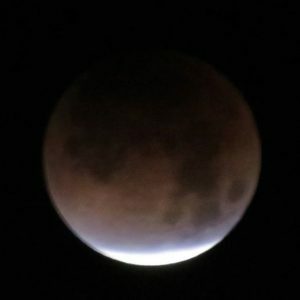 I woke up way too early to see if the Super Blue Blood Moon* eclipse would be visible or blocked by clouds. (You never know, and I didn’t want to wake up the kiddo in the middle of a school night if there wasn’t anything to see.) I had a clear view, but the street lights were too bright to see the red color. It just looked dull brown. So I took a couple of pictures, then went back in to wake up the kid. He still wanted to go out and see, but only for one look. Totally understandable. I carried him out, we looked at the darkened moon, then I carried him back in and put him back to bed. 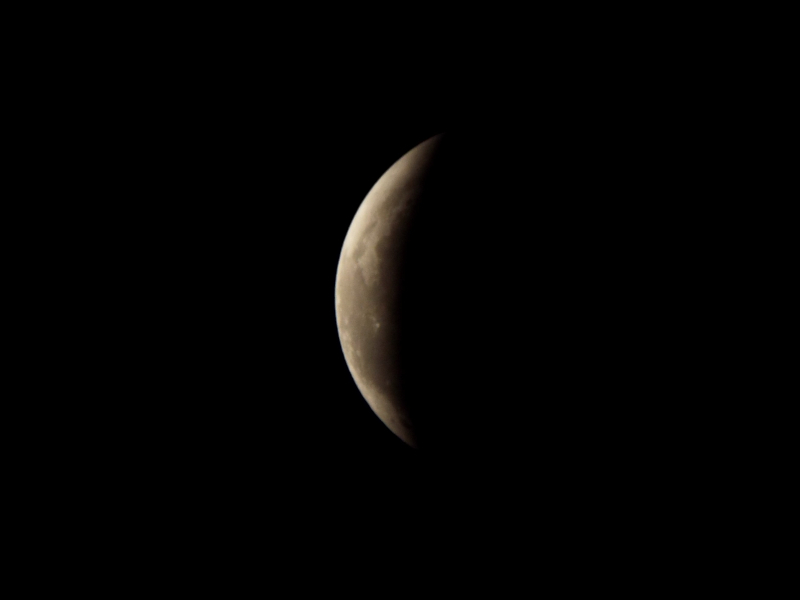 It’s the third lunar eclipse he’s seen, though one of them we didn’t get to see much of since it was so cloudy. And while it’s not as cool as a total solar eclipse, it’s something you can see with no special equipment by walking out into your front yard anywhere in the world that has a view of the moon during the several hours it takes the Earth’s shadow to move across it. I went back out one last time to try for some photos of totality, but they didn’t come out any better than the ones I took the first time. I looked around for a spot that might be darker and still have a view of the moon (without trespassing in someone else’s back yard), but didn’t see one — there are way too many lights at night these days. Then I tried to place the constellations I could see, and failed. Then I went back in to go back to bed. Unfortunately I don’t think I really got back to sleep, so I’ve been dragging all morning. The interruption didn’t help the kiddo either, so getting him to school was a bit of a challenge. 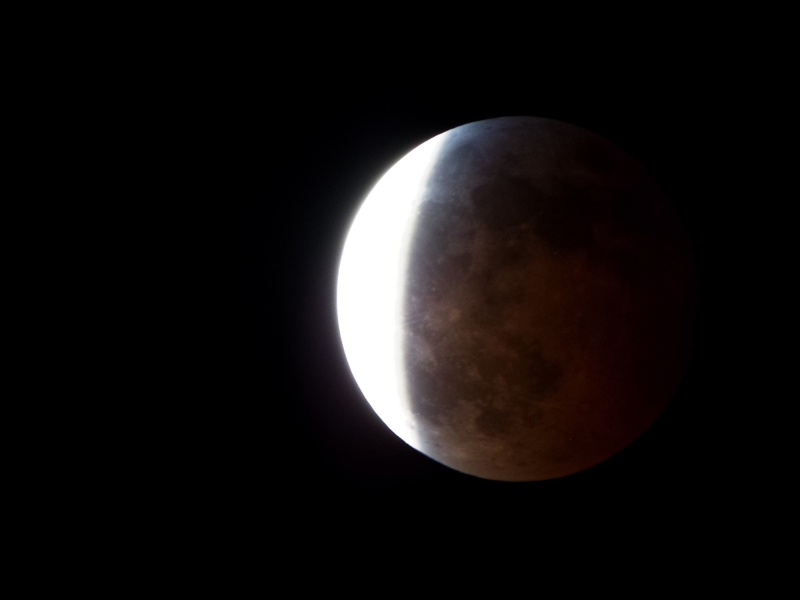 *Blood moon: lunar eclipse, Earth’s shadow darkening the moon & turning it red. Cool to see, widely visible. Super moon: full moon during closest point in orbit, looks slightly bigger. Blue moon: 2nd full moon in a calendar month, otherwise no difference. This entry was posted in Space and tagged eclipse, instagram, lunar eclipse, moon on January 31, 2018 by Kelson. 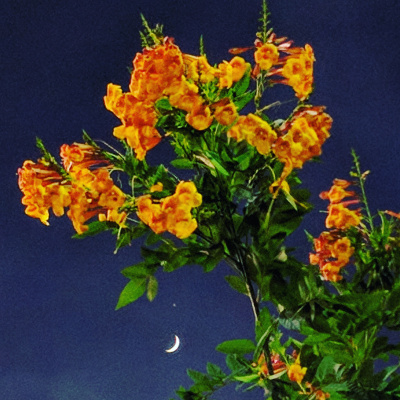 I spotted this view of the moon and Jupiter bordered by flowers while at the Orange County Fair last week. While I love the look of the shot, it’s terribly grainy and full of compression artifacts. My phone isn’t great at things like zoom or low light conditions. I’ve been using it as my main camera for the past year, since it’s great in bright daylight, and my old camera is riddled with dust I can’t get rid of. But this, plus plans for a vacation where I knew I’d really want a working zoom, combined to be the last straw. I checked out a bunch of cameras and settled on a Canon PowerShot SX710 with 30x(!) optical zoom. They’ve automated a lot of the mode settings the older models used to have, but there are still a few specific modes you can use and you can still take photos with manual settings. And yes, you can transfer photos over Wi-Fi, to a device, a computer, or a cloud service. One of the first things I did after charging the battery was go outside to see how it handled night shooting. 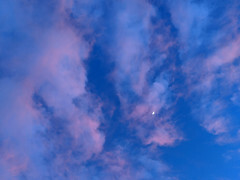 Then I looked up and saw the moon. Amusingly, this happened the last time I bought a camera too. This entry was posted in Photos and tagged camera, moon on August 17, 2016 by Kelson.